The Gulf Coast Regional Mustang Club (GCRMC) was formed in 1979 and is the Pensacola, Florida area's Mustang Club of America (MCA) affiliate. We are dedicated to the restoration, preservation, and enjoyment of 1964 1/2 to the present day Mustang and modified Mustangs. GCRMC is a non-profit 501 (c) 3 organization. Proceeds come predominantly from our Annual Show but Contributions are accepted. 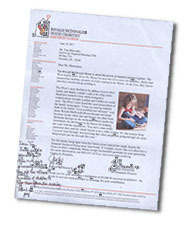 Our benefactors include the Ronald McDonald House™ and the Hadji Shriners Childrens Transportation Fund. Over the past 35 years we have donated over $500,000 to these organizations. Check out our Donations page for the last donation ceremonies. Thank you for considering a donation to GCRMC. If you would like to receive more information about GCRMC, please E-Mail us.